who else wants to sprinkle everything bagel seasoning onto everything? 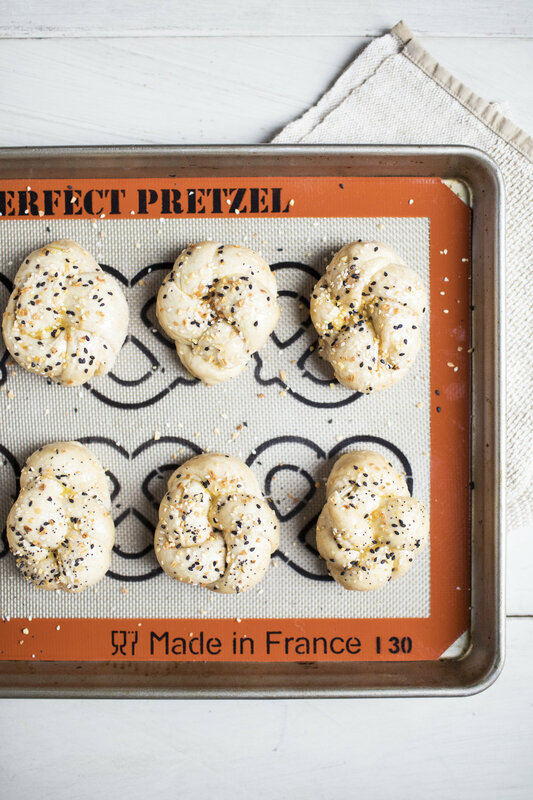 i have been obsessed with making pretzels & pretzel knots for years, but i don't know why it has taken me this long to share an everything bagel version. 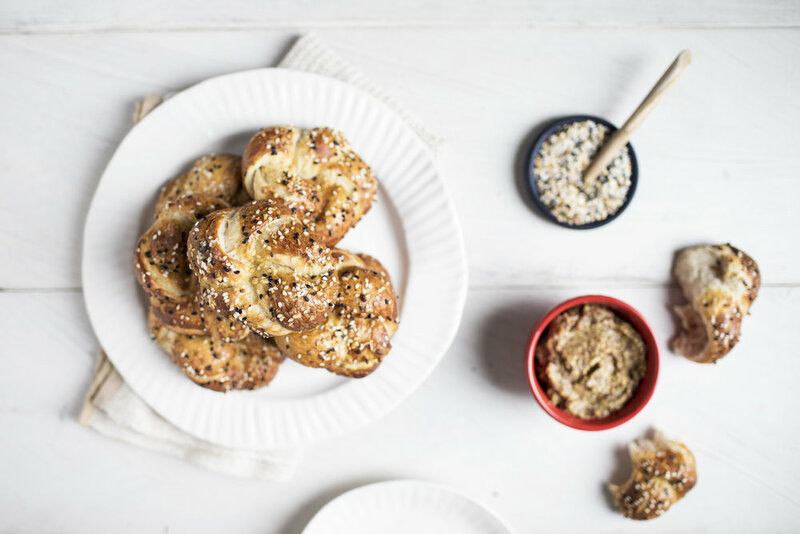 my cookbook also has a couple killer pretzel based recipes that i can’t wait for you to see (yes i am going to be making shameless plugs from here on out), but for now let’s chat this everything bagel version! we had a wicked snow storm this past weekend where justin & i didn’t leave the house. we decided the night before the storm that we were going to bunker in, watch movies all weekend & bake up some of our favourite treats. you can bet these pretzels were at the top of our list! now because it is january & we all want to be a little extra healthy, i did a mix of bob’s red mill’s all purpose flour & whole wheat flour as the base to these. truthfully, i love adding whole wheat flour to my yeast based doughs as it tends to add extra texture & flavour. before the boiling step deters you from baking up a batch of pretzels at home, i promise you they are just as easy to make as pizza dough! don’t let that extra step stop you from making these bad boys. once you take a bite into a freshly baked one, you will realize they were worth all the time & love. lastly, they are best served alongside a whole grain mustard or honey dijon mustard. in the bowl of a stand mixer add the water. sprinkle in the yeast & let stand for 5 minutes or until the yeast begins to foam. if the yeast does not foam, check the expiration date. whisk in the sugar & salt. click bowl in place on a stand mixer fitted with the dough hook attachment. add the garlic, melted butter & one cup of all purpose flour. beat until combined. continue adding the flour, one cup at a time until the dough comes together. knead dough for an additional 5 minutes or until it becomes smooth & pulls away from the bowl. shape into a ball & let rest covered for 60 minutes, or until the dough has doubled in size. once the dough has risen, preheat oven to 425 degrees. line two baking sheets with parchment paper. set aside until ready to use. bring a large pot of water to a boil & stir in the baking soda. shape pretzel into desired knot or twist shape & boil individually for 30 seconds. 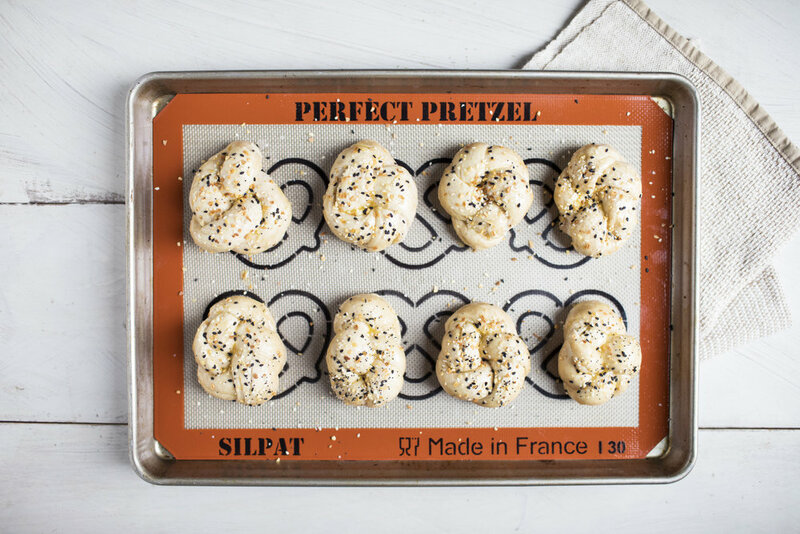 place pretzel onto prepared baking sheet. brush with egg wash & sprinkle with everything bagel seasoning. once the sheet is full, bake for 15 minutes or until golden brown. serve slightly cooled with whole grain mustard! note: i LOVE trader joe's everything bagel seasoning, but if you can't locate it simply mix together one tablespoon of poppy seeds, black sesame seeds, white sesame seeds, minced dried garlic, minced dried onion & flaked salt to taste!